Alder is a deciduous tree that grows in the Northern hemisphere. There are 15 species in North America, and 15 in Eurasia. After being cut into chip, the wood turns light brown with yellow or reddish tinges. Some brands of chips are kiln dried, some are forced-air dried. 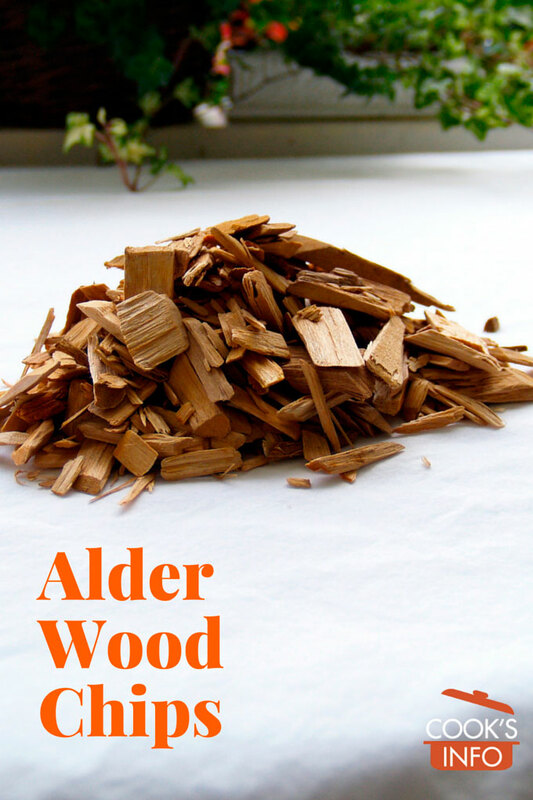 1 kg (2 lbs) of Alder Wood Chips will do 16 to 20 cooking sessions. The wood also makes good charcoal. Soak chips in water for a minimum of 1 hour before use, then toss them on top of your coals. Or, if using in a propane-type grill, put the soaked chips into a smoker box, and place the smoker box on top of your briquettes or rocks. Light the grill. When smoke begins to appear, start cooking. There’s a folk belief that burning Alder Wood attracts the supernatural, which in some places has morphed into a belief that it is hard to burn. Alden, H. Hardwoods of North America. FPL-GTR-83. Madison, WI : U.S. Dept. of Agriculture, Forest Service, Forest Products Laboratory. 1995.